If you’re on Instagram, go check my Insta-stories because this morning our family room rug arrived. This is exciting for us because the rug adds a level of coziness to the room. Our house is (very) slowly starting to come together. This past week our dining room table, family room coffee table and guest bedroom #2 bed arrived. We’re now waiting on our counter stools, which will take 2-4 weeks (insert freaked out face emoji here). Throughout this process, I’ve realized two things: A) decorating your house is freaking expensive and B) furniture takes forever to arrive. Our house was just about perfect when we moved in, but one thing I knew I had to change was the light fixtures. 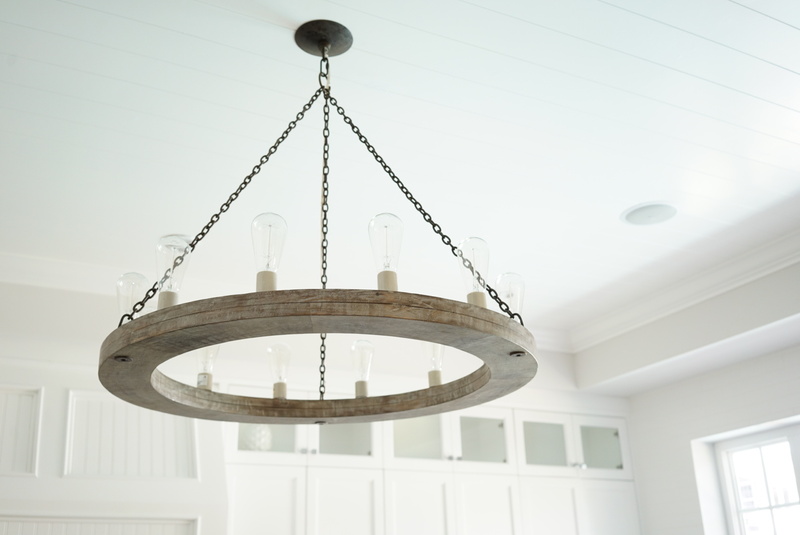 Not all the light fixtures have to go; only the kitchen, dining room and master bedroom need switched out. Our builder chose all very polished silver fixtures which is definitely not in line with my vision. He also wired the master bathroom for a light fixture, but then failed to install one. 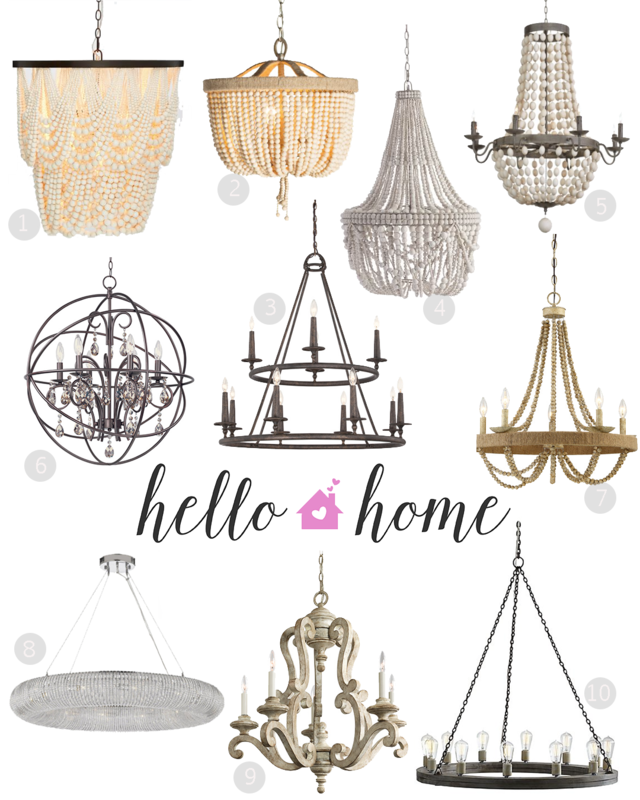 Here’s a round-up of the light fixtures that have caught my eye. I also included the light fixture we bought and Matt installed in our kitchen this weekend. Quick shout out to the men in our lives who are handy. My hubby can do just about anything and I’m so thankful that he’s willing to roll up his sleeves and make my visions come to life! I love all of these fixtures for different reasons. Options #6 and #8 are both dupes for the Restoration Hardware fixtures that leave you breathless as you walk into their showroom. I’m trying to choose between a traditional crystal chandelier or a wood beaded chandelier for the master bathroom, to be hung over the bathtub. I’m not sure which way I’m leaning right now… Which means I need to scour Pinterest and Houzz more, lol. As for our kitchen, here’s a photo of the new fixture in place. We originally found it on Crate & Barrel, but with our account/coupon codes, we were able to buy the exact same fixture on Wayfair and saved several hundred dollars. What do you think? I LOVE it! Leave a comment below and let me know your picks from the above collage for which rooms if you like any of them! Previous Post Thankful for You, Mom! Totally love it! Would have chosen that one too! But 6 is also cute!! Love fixture you picked. Love 1 and 2. Those beaded pearls are gorgeous! I want to see a house tour when it is completed. I love modern and contemporary styles. Also like some farmhouse decor. Thanks to my love of Joanna Gaines and Fixer Upper! Thanks Erin! I’m such a Joanna Gaines fan! Love it!! It looks very similar to my family room fixture! I am obsessed with lights! I tried to pick very unique ones for my whole house. We have been moved in a year now. So glad you guys are getting settled in! Lighting makes such an impact on a room! Gorgeous! I really like fixtures 3, 6 & 8. I think 6 would look great over the master bathtub (my mom has a similar one over hers), & I think 8 would look great in the guest bedroom. I’m not positive about 3, maybe in the living room or in the entryway if y’all have one! ? Now seeing it hung up in your kitchen-I like it against the white! My fave is #4! I think it would look beautiful in a bedroom!